God has left a deposit in my spirit at the beginning of this new year and it is that I should write my thoughts down. I do some of that via this blog, but honestly, I had gotten lazy with capturing God's thoughts as He speaks to me. early on of taking notes, especially in my Bible. Any Bible of mine is filled with dated handwritten notes. Over time I somehow convinced myself that this was no longer a necessity. But then it became abundantly clear that if God's Word was not written down, I and so many others would not know Him - how he works, how he speaks and how he acts, nor would we have the spiritual guidance that we all seek and need. Journaling is a form of writing it down, but that's not necessarily the direction I'm going in. I have tons of journals, most of them empty. 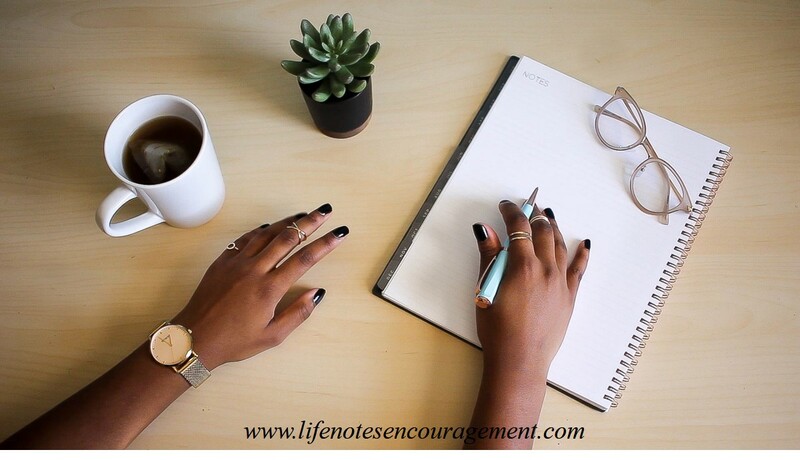 What I'm more focused on is writing for remembering, for seeking God and for confirmation that God has spoken to you. If this is part of your journaling, then keep doing so. In Exodus 34:27, God told Moses to "Write these words....." and because of this we have one of the most known passages from the Bible - the Ten Commandments. Then in Deuteronomy 6:9-12, those same commandments which the Lord gave to the Israelites were to be written on the posts of their houses and on their gates so that they didn't forget the Lord. In Proverbs 3:3 we're told to "write mercy and truth upon the table of our hearts" so that we are never without them. We can all do with more mercy and truth today. In Jeremiah 30:2 the prophet is told to write all the words that God has spoken to him in a book; hence the book of Jeremiah - the weeping prophet who lamented for his people. In Habakkuk 2:2-4, another prophet, Habakkuk was told to write the vision, after questioning God about his people's condition, and to make it plain, for it was for an appointed time. "Write down the revelation and make it plain on tablets so that a herald may run with it. For the revelation waits an appointed time; it speaks of the end and will not prove false. Though it linger, wait for it; it will certainly come and not delay. See, he is puffed up; his desires are not upright - but the righteous will live by his faith.” We often forget the appointed time and only focus on writing the vision with our desires in mind. In Hebrews 10:16 we're shown the blessing of the new covenant. We are no longer constrained by the law which we couldn't obey in full. Instead, "He (Jesus) will put his laws into our hearts and in their minds will I write them." He has written His thoughts in us. Jude "gave all diligence to write unto you of the common salvation"(Jude 3). This book serves as encouragement for difficult times, and in Revelation 14:13 John heard a voice from heaven saying "Write," as he shared his heavenly visions. Writing doesn't always mean the manifestation of our goals and desires however writing signifies diligence and obedience. It can be one of the first steps of growing your Christian faith. It can provide courage to share and to encourage. As God breathes thoughts into you take the opportunity to write those thoughts down. Write so that you remember how God is working in your life. This writing may take the form of verses, prayers, or thoughts. These may be inscribed in books, blogs, journals, notebooks or even digital apps. But capture what God is saying to you so that you're further amazed by his Goodness as he continues to work. Write to know and understand that God is a sovereign, promise-keeping God. So take time, be still, hear what God is saying to you and write it down. How do you capture what God has shown you? Beautiful post. When I write, I always think of one of my fave pieces of Scripture John 1:1 "In the beginning was the Word, and the Word was with God, and the Word was God." My ultimate goal is that my writing ultimately is written to and for the glory of God. Blessed to be your neighbor at the Ra Ra linkup today. I agree totally. Writing creates a record of how God has moved in our lives and thus provides tangible reminders to strengthen us in the times when God seems far away. thanks! Love this post. My Bible is so marked up. I'm wanting a new one, but what do I do about all my notes? I like the thought that God calls us to write down what He is speaking to us and that our written record might still be read, to God's glory, long after we have gone to heaven! Thanks for writing this and sharing it with us!